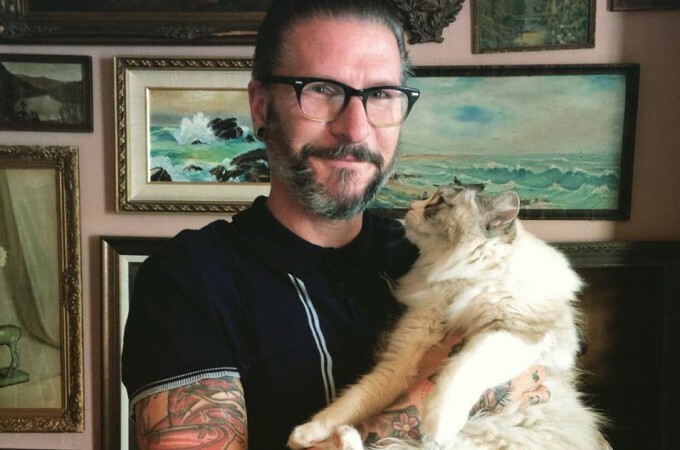 Daniel “DQ” Quagliozzi is the cat behavior guru behind Go, Cat, Go – San Francisco’s leading in-home resource for cat behavior advice. With more than a decade of experience working with cats in shelters and in homes, DQ’s custom designed Action Plans save cat lives, educate frustrated cat guardians and restore peace in homes. Go, Cat, Go is all about the cat, teaching clients to see the world through their cat’s eyes to arrive at a place of understanding and compassion for all parties – feline and human. DQ graciously answered a few behavioral questions the Cat Connection had regarding declaws, cat welfare and the human-animal bond. True to form, his answers left little room for waffling – when feline health and safety are at stake, DQ is the guy you want advocating for your cat. Thank you so much for answering these questions, DQ. In your experience, what motivates cat people to declaw their cats? Do these people love their cats? Generally, I find that people make the decision to declaw their cats because they were convinced to do so by their veterinarian, or because they felt that there would be less damage (scratching) done to their property or harm done to them when petting or playing with the cat. I don’t think there is any love lost in that decision. Yeah, certainly in the past, people, particularly first time cat owners, often declawed their cats because it was essentially sold as part of a wellness package – spay/neuter, declaw, put under only once, one-time pain management, etc. In my own experience, I’ve seen that knowing what they know now, so many of these folks feel guilty about having declawed their beloved cat, regardless of whether the cat has any behavioral or physical issues. What do you tell people in these situations? When I do a behavior consultation and realize a client has declawed their cat, I am always sensitive to the fact that they may feel guilty or harbor some regret about that decision, particularly if I believe declawing is contributing to the behavior that I am there to provide answers and solutions for. If they don’t know much about the surgery, I use it as an opportunity to educate them, so that going forward, the comfort and happiness of their cat is considered in new ways they may have never thought of before. To be fair, I don’t mince words either. I will let people know that their cat may be in pain or discomfort and what measures to take to make that better, but I’m not going to make that advice a personal attack. Ultimately, any advice that I give is going to be in the cat’s best interest, so devoting any time to making someone feel bad about what is already done isn’t going to make this situation any better. Right. We try to be sensitive to the fact that these decisions were not always made with the full facts in mind. If it’s done, it’s done – let’s talk about how to make it better, but please don’t ever do it again. As you know, the en vogue reason to justify declawing is to keep cats in their homes. Do you indeed find cats remain in their homes once they are declawed? In my experience, I find that declawed cats are more problematic in homes, so they are often surrendered to animal shelters with little understanding of how the surgery contributes to the behavior that the guardian now cannot live with. They often don’t see how both things tie together and surrender a cat that never really had a choice in the matter. It breaks my heart, but that’s why I do what I do for a living. I am constantly trying to break the cycle of surrender. I encourage my clients to “surrender themselves, not the cat.” In other words, surrender to what you can’t fix or change about cats and you will find the solutions, instead of giving up on them. It really can be a life or death decision. The life or death part is important. If someone is intolerant of a cat scratching a couch, how understanding can we really expect them to be when the cat starts biting or not using the litter box? Speaking of which, what are these behavioral changes and why do they occur? Declawed cats are often very insecure in their territory, because they cannot effectively leave a visual or scent mark on communal areas that they may normally have scratched. This frustration and insecurity can be a trigger for territorial marking and spraying. Declawed cats may be uncomfortable walking in some common litter types, like clay, crystal or pellet litter. This painful aversion can trigger a cat to choose alternate substrates that are more comfortable to eliminate in, like soft bedding, bath mats or pillows. I always recommend that my clients purchase the softest litter they can find. Over grooming or hair barbering/plucking is also common in declawed cats. Due to the discomfort of their paws, some cats may resort to incessant cleaning of their feet or plucking the hair from the areas between the toes. This can become a never ending cycle and a wound that never truly heals. In some cases, declawed cats may be prone to petting-induced aggression, if they are over handled near their paws or if their limits are constantly pushed to the edge. People can be pretty oblivious sometimes. And the lastly, let’s not forget the emotional effects that the surgery has on cats. Free will is very important to a cat. When they feel like they do not have control or that they cannot make their own decisions, cats get agitated and anxious. When their anxiety is ignored, this can lead to sadness and depression. A sad cat is one that feels helpless and out of control. I’m sure most people can relate to that feeling. A confident cat is a happy cat, and it’s difficult to be confident when someone cut off your toes for no reason. So what do you recommend to clients experiencing these problems, whether they were the one to declaw the cat or not? The first thing I recommend to my clients is that they put themselves in their cat’s place. After we have discussed what declawing is and how the cat may be feeling, it is usually pretty easy to find a solution for the behavior we are working on. Like all things, there is a compromise that has to happen. You cannot solve a cat behavior problems without letting a little of your own s**t go. Sure, maybe it was you that opted for the surgery, but that moment has passed now and we have to be compassionate and understanding in order to make good on a bad decision. To get there… that’s going to take some self examination… and no one is ever excited about that idea, but once it’s achieved, we have a cat that doesn’t piss on your bed anymore and that’s pretty rad. Every so often we encounter someone who insists that all of their cats have been declawed, and they are just fine. While certainly that’s possible, it just seems so unlikely, and I always just assume that the person has lost touch with how cats should move, act, and just generally be. The vet we interviewed spoke at length about the difficulty the average person has accurately assessing whether their cat is in pain or not. What should people look for if they suspect the cat is suffering from some declaw related pain? I agree. Most people have a hard time equating or relating to the pain of another being. Honestly, if we did, there would probably be a lot more vegans on this planet. It can be very frustrating and sometimes heartbreaking to try to explain suffering to someone who just doesn’t see it the same way. I try to find someplace in the middle to make a connection with my client in order to make those hard conversations easier to understand. Cats are really great at hiding pain and suffering, so they enable unaware people to fail at monitoring their health. A cat that has been declawed and may be feeling discomfort will shake off their paws when walking or avoid entering or standing in a litter box all together. They may cry out in pain when walking or jumping up or down to a surface area. Are you encountering fewer or more declawed cats in your travels, and why is that? Honestly I don’t think I can really quantify whether I have seen fewer or more declawed cats since I started in-home consultations. I will say that, in general, it is a rarity that I come across a client that has declawed their cat by their own decision. Most people with declawed cats have rescues that were already declawed by someone else and were surrendered. I do believe that vets are making it more difficult for people to choose to declaw their cats. Not all vets, of course, but we hear many stories of vets attempting to talk people out of declawing. I guess the reality is that if you are so set on declawing your cat that you ignore the advice of both a medical professional and a behaviorist, to say nothing of the folks at the Cat Connection, then that’s on you – nothing going to stop that until it’s illegal. That said, is there anything else you’d like people to know about declawing? I am very happy to see that declawing is becoming a popular subject for all the right reasons. When was the last time you read anything about the benefits of declawing a cat? I think a lot of the information that is swirling around the cat-ernet is mostly in objection to the surgery and written for awareness. More and more cities and states are lobbying for it to be an illegal practice and that is wonderful. I am actually personally involved in a California-based lobby to outlaw declawing, right here in San Francisco. Right now we (mostly lawyers) are just trying to gather supporters and people with strong and far-reaching voices to get our mission to the masses. So we’re still in the early phases, but you haven’t heard the last of this. Certainly not. We’re all very hopeful that as people’s awareness and engagement with their cats change for the better, declawing will eventually be seen as a barbaric practice from another time. It takes a village, and people like you and your cohorts in the cat behavior world are certainly doing your part. I’m so glad that you allowed me an opportunity to voice my own experiences with this. Thanks for being a megaphone to the masses. Enter your email address to get regular news and promotional offers from Cat Connection. Fireworks are Terrifying! Protect your Pet this Fourth of July!